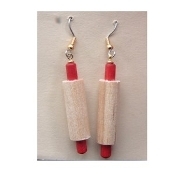 The most ginormous selection of fun novelty earrings & fresh funky discount jewelry for LESS! Funky Retro ROLLING PIN EARRINGS - Mom Chef Baker Mini Bakery Dimensional Novelty Food Cooking Charms Costume Jewelry - Nostalgic solid hard WOOD 3-D Miniature baking charm, approx. 1.75-inch (4.38cm) long. Roll the dough, and put it in the oven for baby and me! Copyright © 1998-2019 TEAM-ZEBRA Unique Funky Earrings & Funky Costume Jewelry. All rights reserved. original bracelets, novelty keychains, handcrafted pins, custom ornaments and personalized gifts. We offer the best deals and lowest prices! Buy $50.00 or more, and First Class Worldwide Shipping is FREE !!! The most ginormous selection of fun novelty earrings and fresh funky discount jewelry for LESS! are the the ultimate fashion statement, and proudly made in the USA! M13 Graphics - Printing services for your business card, flyer, postcard, brochure, and more. Team Zebra Photography has the Best prices and selection of thousands of sports images, volleyball images, sports photos, volleyball photos, sports gifts, volleyball gifts, photo gifts, custom gifts, custom photos, custom images, sports pictures, volleyball pictures. Please contact us at team-zebra@sbcglobal.net to capture your sports, team or special event in the Chicago local area! TEAM-ZEBRA Unique Funky Earrings & Funky Costume Jewelry - Like Us on Facebook - The most ginormous selection of fun novelty earrings & fresh funky discount jewelry for LESS! Team Zebra Photography - Like Us on Facebook - Tell us what you think of our new funky look!!! Celebrate the opening of our new www.TEAM-ZEBRA.com web-store, offering nearly 2,000 different funky earrings and funky costume jewelry styles! Chicago, sports images, volleyball photos, team photos, event photography, sports photos, action photos, park district events, game photos, school sports photos, club photos, club sports, sports pictures, volleyball pictures, photo gifts, sports gifts, custom gifts. Did you know that Team Zebra Photography offers gift items like mugs, shirts, mouse pads, etc, featuring your choice of favorite photos from the site? Take a look, as there are dozens of choices. There are even high quality canvas prints of your favorite action shots available! With over 140,000 photos listed to date, you will definitely find great shots of you, friends or family members... Great personal gift ideas!! !